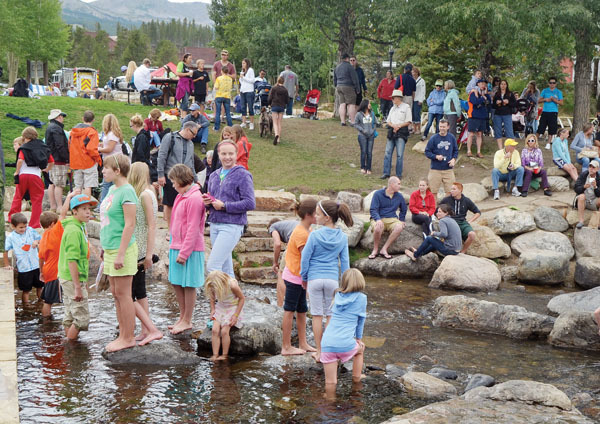 Thanks to the thousands that entered and attended The Summit Foundation’s 25th annual Great Rubber Duck Race. More than 8,300 ducks were entered in the race, a sell out of 750 ducks swam in the kids’ duck dash and a record 191 ducks participated in the business battle duck race. In addition, the creativity was astounding in the 64 entries in the business battle duck decorating contest. The winners are as follows: First: Kirsten Mueller, Bank of the West; Second: Gretchen Hamilton, Gretchen Hamilton Design; Third: Anne Smith, Vail-Summit Orthopaedics; Fourth: Dana Holland, Affiliated Financial Group; Fifth: Daniel McCrery, Traditional Neighborhood Build. Congratulations to Duckstor Erik Dorf and all the Duckstors at Vail-Summit OrthopaeDUCKS for their “bone-in duck” entry that was voted the best decorated duck. And congratulations to David Woodruff and family who won and will cherish the 25th anniversary playhouse giveaway. A complete list of winners can be found at http://www.summitfoundation.org. Top five regular duck race winners: First: Linda Sowaskie; Second: Fami Grotemeyer; Third: Mary Morningstar; Fourth: Ellie Watson; Fifth: Ellie Watson. Top five kids’ duck race winners: First: Kelly (Logan) Sternfeld; Second: Trish (Lauren) Holcroft; Third: Ollie Dixon; Fourth: Greg (Austin) Neufeld; Fifth: Suzanne (Luke) Bolling. While final expenses are yet to be determined, we know that the 25th anniversary of the race raised a record amount of funds for the foundation and all the nonprofit organizations and students we serve. Thank you to every donor, volunteer and community member for the support.